The answer to the question, what if the Xbox 360 Elite dropped to $300 with its exorbitantly priced $100 Wi-Fi adapter included gratis, is easy: It'd be cheaper than Sony's brand new slim-line PS3. 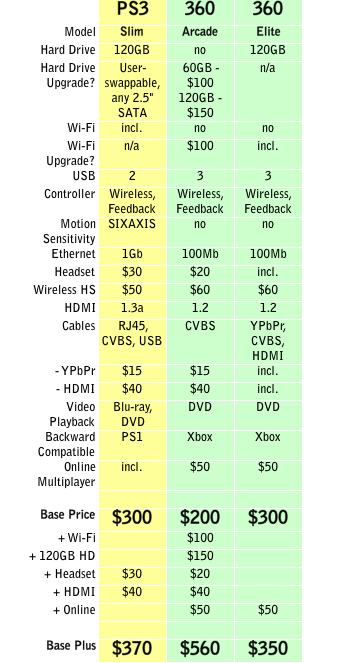 About $20 cheaper, in fact, according to my chart, once you've factored in the basic add-in essentials like headsets, HDMI cables, and online multiplayer fees. $20 cheaper, that is, only if we restrict our estimates to the first year of ownership. After that, the Xbox 360 climbs $50 in out of pocket costs each year if you want firsties on game demos and access to online multiplayer and matchmaking services. If you bought a 360 now, assuming you kept your XBL Gold membership active through projected generational end-of-life roundabout 2013, you'd pay another $150 on top of the chart's $350, or 500 bucks total. But wait. Another rumor has the Xbox 360 Elite at $300, Wi-Fi included, and bundled with Halo 3 ($40 new). Factor according to interest, though for first-timers, I'll wager it rises this autumn with Bungie's Halo 3: ODST coming due. What does Sony have that Microsoft doesn't if all of the above came true? Blu-ray, free online, and its particular stable of exclusives. Since consumers seem to care about Blu-ray's superior video playback features as much as they do the quality of the ultra-compressed music they're downloading from iTunes et al., the format's mainstream value is questionable. There's the 50GB storage-space argument, of course. Final Fantasy XIII will ship on one Blu-ray disc for the PS3, but probably three or four DVDs for the Xbox 360. Then again, disc-swapping never affected sales before, and I doubt it'll register with any but the shrillest detractors here. As a sales point, Blu-ray's gone from "feature of the future" to more of a niche commodity. That said, it's a gorgeous "extra" for those that want pinnacle 1080p video playback without cluttering up their hard drives or compromising on quality per streaming video's marginalized bit rates. Edge: Sony. Then there's online multiplayer. Microsoft charges for it, Sony doesn't. Microsoft buffs claim the 360's online features are more sophisticated and developmentally mature. Sony buffs claim the PS3's are all caught up with the latter's. Microsoft has Netflix and Games-on-Demand. Sony has video downloads and PlayStation Home. You say to-may-to, I say ta-mah-ta. Does Microsoft's feature set justify the $50 per annum price? Your mileage will vary, so we're left to gauge pricing alone. Edge: Sony. Last up, exclusives. Would you rather play Halo 3: ODST and Mass Effect 2? Or Gran Turismo 5 and God of War III? I don't see either system leading here, just two boxes with a bunch of games I want to play. Edge: Tie. A $300 Xbox 360 Elite seems all but certain, but will Microsoft finally blink when it comes to $100 Wi-Fi? Let's hope so. The Xbox 360 leads in the US (by a lot) and Europe (by a little) but the NPD Group's already predicting a 40-60% sales boost for Sony's new PS3. Trying to justify $100 for a four-year-old 802.11g USB adapter--one-third the price of a PS3 Slim, or half the cost of an Xbox 360 Arcade--is either out and out price gouging, or the World's Worst Manufacturing Deal Ever.